Not only is this Frankenstein caramel apple cute, it is a lot more kid friendly than the caramel apples I am used to making. This one is only caramel and chocolate coated on about 1/4 of the apple, so that makes it only 1/4 of the sugar rush! Plus it is a cute little Frankenstein monster! What isn't to love! 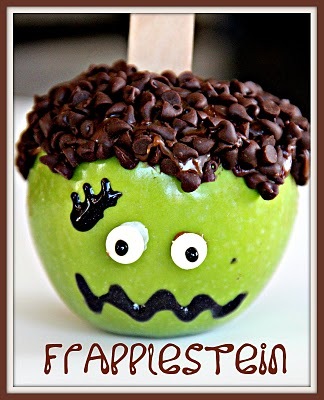 You can check out how to make a Frapplestein Frankenstein caramel apple over at Blue Skies Ahead.